Radio panel recording about the future of libraries and books recorded in Australia at the State Library of Queensland with the Australian Broadcasting Corporation’s (ABC) Radio National Big Ideas show. What a joy it was to participate on this panel while in Brisbane in February about the future(s) of libraries and of our partner in evolution, the book. The event was recorded in front of a large live audience at the State Library of Queensland on 11 February, 2014 with host/producer Paul Barclay. Simon Groth (Dir of if:book Australia, exploring the future of the book @simongroth). Jane Cowell (Director of Regional Access and Public Libraries, State Library of Queensland @janecowell8). Eli Neiburger (USA (remotely via call in), Associate Director for IT & Production, Ann Arbor District Library @ulotrichous). What is the new business model for the library? 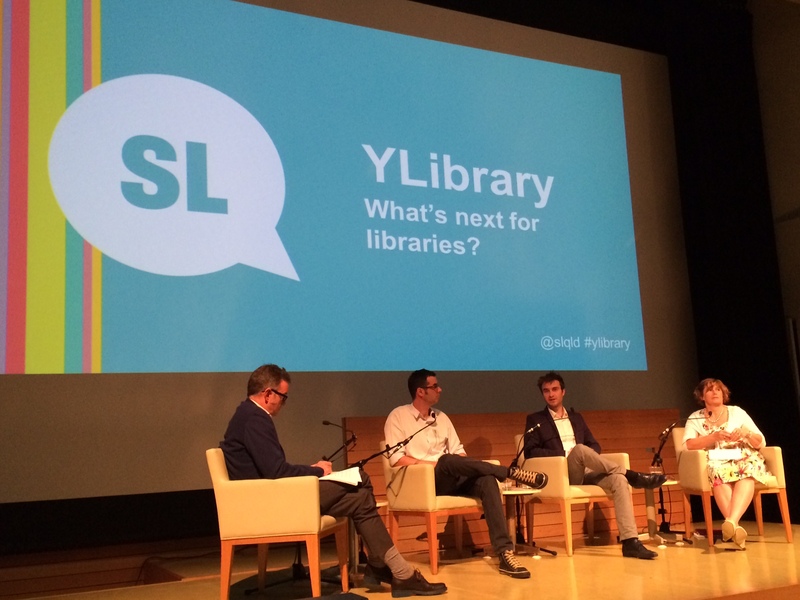 How are the future of libraries and the future of the book intertwined? What is the role of the physical library considering new challenges and alternatives? This panel was one of the most fun conversations I’ve had in a long time. Give a listen & share what other questions you feel should be asked & what assumptions we need to challenge. I asked fellow panelists about how the future of libraries and of books are intertwined but it seems mostly for the benefit of libraries. Can libraries assist the future of books more aggressively? Can we be partners in new moon programs for the book etc? Our host wrapped up the session with a question about librarians being adequately equipped to become agents of change. Jane pointed out that librarians like to play with, trial, and make stuff and are helping our communities become creators. I discussed how this is the generation of librarians facing the tension of change and how we are going to emerge from it three years down the line with the librarians who are not willing to be the creative creators pushed out of the way. You will be absolutely devoured in our market if you are not willing to be change agents. Libraries now have a role facilitating and inspiring change in our communities. So I believe there has never been a more exciting time to be a librarian and am so thankful that I am one right now. We also expanded our conversation with great in-depth Q&A from the audience. I noticed that Australian librarians are smiling, you are wonderfully optimistic about the future. Inspiring. I also later observed dozens of people using the wifi around the library after hours: on benches, in the park, doing school work, Skyping, FaceTiming, working together. The library provides a service on site, connection, even beyond open hours. Thank you to the SLQ librarians and event organizers, inspiring fellow speakers (make sure to connect with these very smart professionals), host Paul Barclay, and the great audience. What is next for libraries? Always a fun conversation that drives curiosity/creativity.